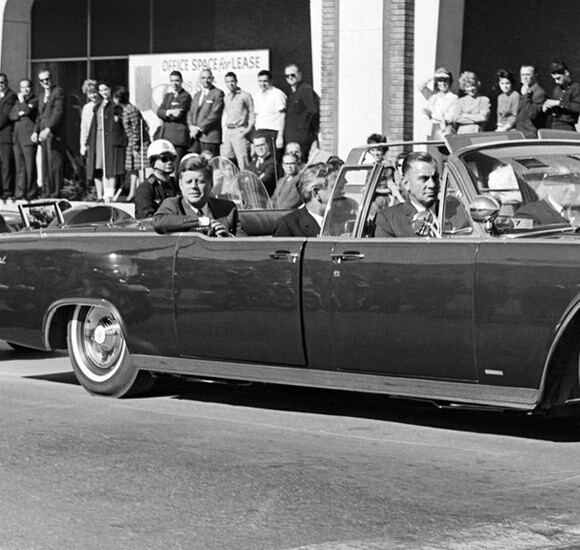 1963: President John F. Kennedy is assassinated as his motorcade passes through Dealey Plaza in downtown Dallas. Texas Gov. John Connally, riding in the same car as Kennedy, is seriously wounded. The Warren Commission, set up by order of President Lyndon B. Johnson to investigate the assassination, concluded that Kennedy was killed by a lone gunman, Lee Harvey Oswald, firing from the sixth floor of the Texas School Book Depository. Although the report was widely accepted at first, skepticism grew as more information concerning possible conspiracies leaked out. Oswald denied having anything to do with the shooting at all, let alone being part of any conspiracy, but he was killed — and silenced — two days after the assassination while in the custody of Dallas police. That, coupled with the FBI’s miserable handling of the initial investigation, did nothing to quell the suspicions of those who believed Kennedy’s assassination was the work of (pick one, or more than one): the CIA, Johnson, the mob, Fidel Castro, the anti-Castro Cubans, J. Edgar Hoover. Whether the shooter was acting alone or as part of a bigger conspiracy may never be known. Most of the available evidence, such as the Warren Commission Report, is inconclusive. But the other big assertion — that Oswald (or whoever the Book Depository gunman was) had help from shooters on the ground — has never been adequately supported by hard evidence, either. The so-called “grassy knoll” theory maintains that one, or possibly two, gunmen shot from ground level in Dealey Plaza. A number of eyewitnesses claimed to have heard gunfire coming from the grassy knoll, but nobody actually saw a gunman, and no shells were ever recovered. The Warren Report, basing its findings on the autopsy and forensics reports, concluded that two bullets struck Kennedy. They came from the same weapon, a bolt-action Mannlicher-Carcano military rifle of Italian manufacture that was recovered at the Book Depository. Three shots were fired, all from above and behind the target. The first missed. The second, the so-called “magic bullet,” passed through Kennedy and tore into Gov. Connally, causing all his wounds. The third shot, the killing one, exploded into the right side of Kennedy’s head. Conspiracy theorists point to the impossible trajectory of the magic bullet, and to the 26 seconds of silent film shot by Dallas dressmaker Abraham Zapruder, which shows Kennedy’s head snapping backwards as the fatal third shot takes off the right side of his head, as evidence that shots came from more than one direction. Forensics experts disagree, however, arguing that the described path of the second bullet, while improbable, was not impossible and that Kennedy’s head snap at the moment of impact suggests a reaction to the first bullet striking him and not the second. Half-a-century later, we’re still not entirely sure what happened in Dallas that day. The assassination changed the political landscape of the United States. The aftermath changed the media landscape of the world. Zapruder sold the publication rights to his film images to Life magazine, which ran the jarring, graphic still frames in its next issue a week later. The sequence was not shown as a film clip on network television until 1975. Where were the TV cameras? They were in studios. Most television cameras of the time were still bulky and barely mobile, the size of refrigerators. Even mobile TV vans relied on landlines. The president of the United States was not yet under constant video watch. But what was on television from Friday to Monday of that November weekend was the return of Kennedy’s coffin to Washington, D.C., his repose in the East Room of the White House and lying-in-state in the Capitol Rotunda, the funeral at St. Matthew’s Cathedral, the burial at Arlington National Cemetery and the various processions and corteges linking these events. That and, of course, the live onscreen killing of Lee Harvey Oswald in the Dallas police headquarters. It was a harbinger of the media world to come. Transoceanic satellite links were new and expensive, but this was a story of such unexpectedness, such importance and such personal drama that TV pulled out all the stops. The weekend’s events were watched in grief, shock and horror by millions around the world. Communications theorist Marshall McLuhan deemed the Kennedy assassination and funeral a founding instance of the global village, a media experience shared in real time across borders and continents. An earlier version of this article appeared on Wired.com Nov. 22, 2007.